It is my aim in the following thesis to reveal and elucidate a very particular thread running through the respective philosophies of Martin Heidegger and Jacques Derrida regarding language and its role in the experience of Being and the thinking of radical otherness. The complex, nuanced and sometimes highly charged relationship between the work of these two philosophers has often been commented upon, Derrida being considered by many to be one of the most engaging and intelligent readers of Heidegger’s philosophy. My study here will certainly consult with Derrida’s readings of Heidegger; however, my task will also require a fine-combing through those themes in Heidegger that run implicitly through Derrida’s work, whether silent or silenced. My desire in following this path is to develop an understanding of the modalities of thought proposed by both philosophers as means of experiencing that which is not reducible to the presence of logos. The thesis will be divided into three major sections, examined under the headings of Différance, Possibility and Link. In the first of these sections, entitled Différance, we will look at the way in which this Derridean concept emerges from a Heideggerian space, most specifically that of Ereignis and the “letting-be” inherent to the temporality of Being. Heidegger’s famous “Kehre”, which radically shifts the focus of his work on Being, could be seen as the starting point in a philosophical movement which challenges the very mode of thinking proper to Being. We will first of all develop an understanding of the emergent concept of Ereignis in Heidegger’s thought, through a preliminary study of the texts Time and the Other, Identity and Difference and The Thing. As we shall see, Heidegger’s eventual analysis of Ereignis requires that one accommodate for a doubled movement of revealing and concealing in order to think Being in a non-reductive manner. It is from this point that we shall mark how Derrida’s Différance manifests itself within the same modality of thought as the Ereignis. The understanding of this temporal co-belonging (a term which will itself be of no small significance to our study) is vital to our development of the rapport between these two philosophies. In the second section, entitled Possibility, we will look at how the theme of the impossible marks a radical break in Derrida’s philosophy from that of Heidegger. A deeper comprehension of the notion of aporia in Derrida’s work will aid us in drawing a certain line between the projects of destruktion and deconstruction, the latter being a term which Derrida uses as a translation for Heidegger’s German word, but which has a much deeper significance in its own right with regard to Derrida’s thought. Derrida has noted on several occasions that his “critique” of Heidegger is often made from another place in Heidegger’s oeuvre; our task here will be to examine most particularly Derrida’s reading of Heidegger’s discussion of Being in terms of its revealability (offenbarkeit) and to examine whether this can be thought in tandem with the structure of “letting-be” proper to the primordial temporality of Being. In arguing that the history of Being is one of its own necessary concealment (and thus its own revealability) Heidegger can be accused of reducing the “other” of the history of metaphysics to a structure of possible revelation. Our focus will be set most specifically on the possibility of revelation as “event” in Heidegger, and Derrida’s counter-argument that the event is always impossible. Albeit that it would suit us well to conclude our study on the subject of this seemingly clean “break” between two philosophical movements, there is a further complication to be unfolded between the work of Heidegger and Derrida, on the subject of affirmation. As our section on possibility will discuss, Derrida often questioned the privileging of the question as the “most pious form of thought” in Heidegger; however, in Heidegger’s later works (and indeed, in Derrida’s later work on Heidegger) there arises the notion of Zusage, a “primary affirmation” or acquiescence that must always precede the question in language. Accounting for this rethinking of the modality of thought in Heidegger will allow us to redevelop the theme of “letting-be”, this time from the point of view of a link with otherness that precedes or exceeds the telos of the question. Through an engagement with Derrida’s writing on the infinite otherness of chora as well as Heidegger’s analysis of the poetic writings of Stefan George, our task will be one of looking at trace, desire and affirmation in terms of a Link with otherness that is both non-reductive and non-hyperbolical. It is my argument that an elaboration of this dialogue between Derrida and Heidegger brings us to the core of Heidegger’s proposed “way to language” – leading us to an understanding, if such a term is appropriate here, of the dynamic by which thinking and Being are appropriated to one another. Doing so will require that we completely rethink the “nature” of Being, in a manner that cannot opposed with any notion of “otherness”; in fact, our study will propose that to experience the thought of Being in the “way” proposed by Heidegger, we must understand how Being others – how it becomes other. Our juxtaposition of trace and the experience of language will enable us to better approach the relationship between temporality and language in both Heidegger’s and Derrida’s work, and as such to develop a nuanced understanding of the “task” of thinking. One might protest that to attempt to name such a dynamic mode of thought in a thesis would ultimately itself lead to its reduction. Our task shall as such not be one of naming, but of the careful tracing of certain movements in thought, and the opening of a space within which they think themselves into illumination. In Heidegger’s own words, “in this realm one cannot prove anything, but one can point out a great deal”. It is perhaps possible to say, without recourse to any reduction, that the Heideggerian philosophical project and that of Derrida belong to one another. This is not to say that they share the same origin, nor that they aim towards the same goal; it is moreso an acknowledgement of the singular demand that these projects place on thought, on language and on philosophy itself. We will begin here with the history of metaphysics, and as such with Heidegger’s task concerning its destruktion. Since Plato, and reaching its zenith in Hegel, this history has been one of the thinking of Being in terms of presence. Being, that which every worldly entity has, was itself thought in terms of being-an-entity. Even if considered the greatest or highest of all entities, to think Being in this way reduces it to the hegemony of presence. Heidegger’s objection shakes the very structure of this system of thought; Being, as that which brings all entities into presence, cannot be an entity, and furthermore cannot itself be thought in terms of presence. This ontological difference between Being and the entities provides the backdrop for his seminal work of 1928, Being and Time. Although our visitation to this most documented point in Heidegger’s thought does it a great injustice in its brevity, it will be of benefit to our project to understand the necessity for the perceived “turn” (Kehre) in Heidegger’s thought. The existential-ontological constitution of Dasein’s totality is grounded in temporality. Hence the ecstatical projection of Being must be made possible by some primordial way in which ecstatical temporality temporalizes. How is this mode of the temporalizing of temporality to be Interpreted? Is there a way which leads from primordial time to the meaning of Being? Does time itself manifest itself as the horizon of Being? The reasons for which Heidegger’s project in Being and Time was left uncompleted are rooted in the question of temporality. The existential analytic of Dasein, wherein we are first introduced to the primordiality of temporality, was seen by Heidegger as the route through which we could arrive at an understanding of Being. Dasein’s privileged position among the entities as the seat of the ontological difference led Heidegger to believe that a thorough examination of its directedness towards the question of the meaning of Being could re-open the thought of Being that had been forgotten in the history of metaphysics. However, it is through this illumination of the temporality of Dasein that Heidegger comes to realise the limit of the existential analytic as a route to Being; in thinking Being always from the point of view of the entity, the temporality proper to Being itself is reduced to that of Dasein. The danger to be avoided here is that of doing the same to Being as did the history of metaphysics: of reducing Being to the status of an entity and thus to logocentric presence. As we noted above, Being, as that which gives presence to all entities, is precisely that which is irreducible to both. As such, Heidegger’s task in abandoning Being and Time is that of thinking Being not from the point of view of the entity, but rather “to think Being without beings”. The temporality of Being, which Heidegger termed temporalität, is therefore marked against that of Dasein (zeitlichkeit). This “true time” of Being is one of a mutual reaching out and opening up of past, present and future, a dimensionality “in which futural approaching brings about what has been, what has been brings about futural approaching, and the reciprocal relation of both brings about the opening up of openness”. This openness is key for us here, for it is in this “clearing” that will be brought about the space of a certain co-belonging of Being and the entity, and the rupture in thinking that opens the space for différance. How is it, we must ask, that the ecstases of time are open in temporalität in a manner different from their interaction in zeitlichkeit? The difference is explained in Heidegger’s essay “On Time and Being”, and relates to a more dimensional conception of the ecstases, where, instead of being unified through the projected and anticipatory resolute nature of Dasein, they are maintained as themselves through a primordial dimension of “nearhood”, or “nearing nearness”. When our thinking of temporality is with recourse to the “vulgar time” prevalent in the history of metaphysics, the ecstases of past, present and future are thought of only within a framework that prioritises the present. As such, the past is thought of as “no longer present”, the future as “not yet present” – and as a result of this, our conception of time is limited to that of a series of “nows”, stretching out before and behind us in history. Although the zeitlichkeit of Dasein, in being constantly projected beyond itself, can be markedly told apart from that of the other entities present-at-hand, it still holds on to that which is a becoming-present in the other ecstases from Dasein’s point of view. It is the conception of a fourth dimension of time, that which “is, in the nature of the matter, the first”, which marks the significance of temporalität as “true time”, and which sets us firmly on the road to an understanding of just how radical Heidegger’s movement in thinking the Ereignis is. Nahheit (“nearhood”), a term taken from early German and used by Kant, is understood by Heidegger as being a primordial dimension of temporalität which determines the dimensions of past, present and future. This nearness brings the dimensions of time close to one another as themselves by withholding and denying that within them which would be seen as an advent or approach of the present. As such, the ecstases of past, present and future are allowed to remain “open” to one another in a fashion that cannot occur in the common Aristotelian conception of time. Past and future are “let presence” without reference to the present (this seeming contradiction in language will be resolved in our discussion of “The Thing”). Even at this early stage we can see the challenge that Heidegger is posing to thinking; in noting that the ecstases of time can only be brought near in being maintained as themselves at a distance, he subverts not only our vulgar conception of time but also the notion of understanding as logos, predominant throughout the entire history of metaphysics. At this point in our project we can acknowledge the indication of an entirely different conception of time; the “true time” proper to Being. However, to understand the full significance of temporal “nearness” in relation to the our grasping of the Ereignis we must return to the entity, or more specifically, to “The Thing”. worlding world, then we are thinking of the thing as thing. Our understanding of the openness of temporalität brings us some distance towards the thought of Ereignis. What is key is the notion of nearness not as the bringing of something towards presence, but rather a sort of a letting be, or “letting presence”. When thought in relation to the world of entities, this withholding of presentification is that which allows for a nearness to the thing in itself – both in terms of that which is present and that which is radically irreducible to presence: Being. In his essay “The Thing”, Heidegger questions this “in itself”, and as such differentiates the object as it exists for human consciousness as ‘present’, and the thing as it is in and of itself. 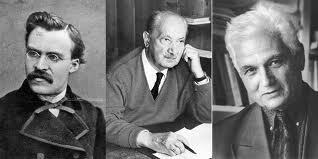 Taking as his starting point Kant’s division of the phenomenal and the noumenal, Heidegger considers how the latter could, through the dynamic of nearness, be encompassed in thought. The answer is to think the thinging of the thing. What may seem to be a mere play in language – the thing “things” – is in fact for Heidegger a key shift in the understanding of the temporality proper to the presencing of the thing. The nearness of “pure” time allows for a movement of “giving” whereby Being recedes and conceals itself from presence in the very “letting presence” of the thing. Albeit that scientific thought can explain an “object” in the minutest detail, this is always a making-static of the thing, a bringing into presence that fails to encompass the receding of Being. Such an approach to the entity thus merely reaffirms the ontic-ontological difference. To truly think the thing is to think its dynamicity – to bring the thing near by letting it be as itself – by letting the thing thing. It is in this thinging of the thing that the entity and Being cross; this Ereignis, or event of Appropriation, is a co-belonging of Being and the entity. That is to say that, in the thinging of the thing, Being and the entity appropriate one another. The principle of identity itself gives (the meaning and belonging of identity) to us, if we listen carefully to its key note, if we think about that key note instead of just thoughtlessly mouthing the formula “A is A.” For what the proposition really says: “A is A.” What do we hear? With this “is” the principle tells us how every being is, namely: it is the same itself with itself. The principle of identity speaks of the Being of beings. If thought in terms of logos, the statement that “A is A”, is heard as a tautology, just as is the statement, “for Being is”, when considered in terms of presence. However, Heidegger hears in Parmenides’ logic an understanding of how being is a language that expresses the very same sense by which we came to understand the “thinging” of the thing, the “letting thing” of the thing for which the nearness of temporalität provided opening. In this non-representational language, it can be understood that, just as the thing things and the world “worlds”, Being IS (being be-ings). What is required here, at the place of thinking the Ereignis, is nothing less than the rupturing of logos in favour of an active, verbal language. In the doubled movement of Ereignis, where in giving the entity into presence Being recedes from presence and conceals itself, Being is. There must be a “spring” in thought that moves us radically away from any conception of Being that sees it merely as the ground of beings towards an attesting to this active, double and non-dialectical movement. If man were not the constant receiver of the gift given by the “It gives presence”, if that which extended the gift did not reach man, then not only would Being remain concealed in the absence of this gift, not only closed off, but man would remain excluded from the scope of: It gives Being. Man would not be man. We are, in our negotiation of this realm of Heidegger’s thought, edging ever closer to the space of différance and our provisional instalment on trace. However, it would be remiss of us to leave the Ereignis with a sense of a totally abandoned Dasein. Although Da-sein can now be interpreted as the be-ing-there of Being in the concealment-unconcealment of Ereignis in every thinging thing, man’s “attestation” to Ereignis is not a mere mental exercise: it is central to what Heidegger will denote as the “identity” of both Being and man. The place of man, language and thought in relation to Being will be of import to an understanding of the Derridean task of deconstruction and to our eventual discussion on zusage in Heidegger’s work. Man is a being, and as such belongs to the totality of Being in the same way as animals and inanimate entities. However, it is in man’s nature to “listen” to this Being; man is “face to face” with Being and responds to it. This does not come as a great surprise to us; the Dasein of Being and Time was elected above the other entities for the precise reason that Being was an issue for it and that, as a result, it was within its nature to ask the question of the meaning of Being. However, our limitation in thinking of Being in terms of Dasein’s question was that we could only think Being in terms of its relation to Dasein. The unexpected result of thinking Being in terms of the temporal “letting presence” proper to it is the discovery that Being belongs to man in the same mutual appropriation as does man belong to Being. How can this be the case? According to Heidegger, it is the destiny of Being that it should “arrive as presence”. Being’s act of concealing itself in the history of metaphysics is precisely that which makes possible its revelation as aletheia: truth as unconcealment. Being can only be “unconcealed” in such a way to man. Man and Being are appropriated to one another. They belong to one another. The metaphysical tradition has always sought to think this relation between Being and thinking (the distinctive characteristic of man in Heidegger’s account) in terms of the intertwining of two separate essences. Heidegger urges us to rethink the notion of “belonging together”; instead of the customary “belonging together”, we can hear “belonging together” – belonging as that which determines Being and man. We recall Parmenides’ fragment, “for the same perceiving (thinking) as well as being”. Being and man belong to one another in the Same, and their identity cannot be thought outside of this active belonging. According to Heidegger, it has taken two thousand years, through various epochs (instances of concealment in history) of Being, for this “face to face” link between man and Being to become apparent to thought. Their confrontation is made clear to our age through the “framework” provided by the world of technology; in the “worlding” of our modern world, the mutual appropriation of Being and man accosts us at every turn. One is inclined to think of technology only in terms of man’s plans and endeavours, as something totally of his making; as such, we are limited to an “ethics of technology”, wondering whether man will become its servant or remain its master. We fail to hear “the claim of Being which speaks as the essence of technology”. What Heidegger terms the “framework” – the confrontation of man and Being in technology – is what provides the opening for an understanding of Being that has been impossible in the history of philosophy. This “framework” is what both allows and necessitates the spring in thought towards an understanding that it is only in reaching out towards one another that man and Being achieve their active nature. It is at this juncture that we come to understand the importance of language in Heidegger’s later philosophy, and his reasons for becoming absorbed in the study of poetry. Only in the language of man can Being achieve aletheia. That is to say that, although Being’s movement in allowing the entity to present itself is always a concealment, the “letting presence” of Being itself is an unconcealment in, and only in, the language of man which attests to it. And, always and at the same time, man only has “world” in his capacity for attesting to Being. Only man can attest to, and thus participate in, this active nature of Being; only man can grasp the worlding of the world, and it is this ability to do so that makes him man. For language is the most delicate and thus the most susceptible vibration holding everything within the suspended structure of the appropriation. We dwell in the appropriation inasmuch as our active nature is given over to language. For Heidegger, language is thus “the house of Being” – that which can let Being presence and allow it to “be” in a non-reductive, non-tautological sense. It is also the “home” in which “man dwells”; language is the space wherein man and Being are appropriated to one another. Heidegger’s philosophical project is concerned chiefly with the thinking of Being; as such his direction from the thought of Ereignis is always towards a more poetic, more open language in which Ereignis, worlding world and thus Being are “attained to”. However, it will be interesting for us to look at how, in the work of Jacques Derrida, this “opening” in thought and language can be considered in relation to questions of justice and otherness that also stem from Heidegger’s philosophy, albeit indirectly and as much in relation to what Heidegger did not write as what he did. We move, then, to a philosophy similarly riveted to the task of removing thought and language from the tyranny of logos. Derrida’s concern in Différance is with writing; however, the strategy of thought employed therein, as the thinking of an active, digressive difference irreducible and subverting of presence together with a difference that is always asserting its identity as presence, could be said to be the cornerstone of his entire philosophical project. This “doubling of thought”, as we shall see below, emerges from a space of Heideggerian temporality, and owes much to the sense of identity elaborated upon in “Identity and Difference”. This should not be seen as a mere happenstance; although Derrida’s project does not share Heidegger’s unwavering devotion to Being, its engagement with temporality and language springs from a similar problematic. As was the case with Heidegger, Derrida questions the prominence of logocentrism and presentification in the history of Western Metaphysics. Taking up Heidegger’s call for the destruktion of metaphysics, Derrida proposes “deconstruction”: a method of reading which displaces the logocentric idea of the “essence” of a text, reversing metaphysics upon itself to think its own “unthought”. However, where destruktion has for Heidegger the very clear aim of uncovering meaning as fundamentally related to Being (un-concealment), deconstruction is in this respect aimless; it reveals only that every text is always and already engaged in the movement of différance between phonetical/alphabetic writing (writing as we normally conceive of it, as meaning present on a page) and archi-écriture, a writing of pure difference which consistently perverts the possibility of phonetical writing and thus defers itself from writing as presence. As was the case with Heidegger’s attempt to think the Appropriation of Being and beings, there is here the necessity to think a certain co-belonging of that which is irreducible to and corrupting of presence and that which asserts its identity in presence. The importance of the “letting presence” of temporaltät, and thus the dimension of nearness, is as crucial to Derrida’s project as to Heidegger’s. Derrida thinks the dynamic of nearness through what he terms trace – a thinking of that which is other-than-present as other-than-present. It is in and within this challenge in thinking to preserve distance and thus nearness as trace of other as other that Derrida introduces différance, a play on the two meanings of the verb différer in the French language, one meaning “to defer” and the other “to differ”. Différance, which is a homophone and an orthographic corruption of différence (difference), plays most specifically between the infinitive of différer (to defer) and the present participle of différer (to differ) – différant (different/differentiated). It is as such a language that is at once verbal and nominal. It describes an immemorial and endless process by which identity differentiates itself from the oscillation/indecision of difference and asserts itself in presence, but wherein this identity is consistently subverted and made different from itself by a radically “other” difference which escapes presentification. Différance is thus, in and of itself, the very thinking of nearness that is central to Heidegger’s later thought. An understanding of the continuous oscillation of indecision in différance is key to any grasping of Derrida’s writing on language and justice. It is also in and within this indecision that will be marked for us a divergence from Heidegger’s philosophy on the subject of possibility. If we are to understand différance as a perpetually corruptive force, and the trace as something which always leads us to what is other-than-present (a dynamic that will be central to our third section), then how is it possible to ever conceive of an unconcealment of Being? Can there be such a thing as a revelation preceded by its own possibility, by its revealability? It is with these questions in mind that we approach our second section. As we mentioned earlier in our study, Heidegger makes the argument in “Identity and Difference” that it is the destiny of Being that it be revealed in presence. As such, there is a certain constellation between an originary concealment of Being in the History of Metaphysics and Being’s revealability (offenbarkeit) for man in the Ereignis. Refusal is the highest nobility of gifting and the basic thrust of self sheltering-concealing, revelation (Offenbarkeit) which makes up the originary essential sway of the truth of be-ing. Only thus does be-ing become estranging itself. In this notion of revealability, we can tease the Derridean notion of deconstruction apart from the Heideggerian destruktion that it was once seen to merely translate. Both of these strategies of “reading” the history of metaphysics involve forcing it back upon itself to reveal its “other”: its unthought and unsaid. However, for Heidegger’s destruktion, riveted as it is to the thought of Being, this unthought is precisely Being itself, the being of Being. There is a clear telos to Heidegger’s destruktion; that of the revelation (offenbarung) of Being whose destiny, in being concealed, is to be revealable in the thought and language of man. That is to say that the concealment of Being is that which opens its originary possibility for being-revealed. Heidegger’s reading of the history of philosophy is as such always and already leading towards the revelation of Being. The radicality of the Derridean project of deconstruction is that there exists no such possibility. Such is the nature of the indecision of différance that the reading of any text (or, indeed, context) can lead only to a point of aporia, of total impasse. It may be difficult for us to present Derrida’s understanding of aporia in abstraction; for the sake of clarity, we will reflect for a moment on it’s import in his writings on justice. Our arrival at a point of aporia in relation to justice results from a deconstruction of the relationship between unconditional and conditional justice. There are, when one “reads” the entire problematic of justice, two conceptions of law: the absolute Law, which is its own authority and cannot be reduced to presence and: the laws or conditions of justice, which are specific and present to every instance of just action or decision. The Law of justice is the call to be just at all times, to act in a just manner, to be just in all situations, actions and decisions; this call is not divisible into anything except itself – it is its own reason, and as such is unconditional. Irreducible to presence, it must be preserved as a ‘pure’ concept, for it is only as that which demands that one always be just that it can continue to guide just action. However, to act purely upon this absolute Law of justice in all situations is inevitably not to be just at all, for one is merely applying a generic rule to every situation. Furthermore, given that this Law is unconditional, one cannot ever question its conditions and runs the risk of doing violence to those towards or on whom one acts, as well as that of totally sublating the self (or other others) to the other. We recall Derrida’s problematisating of Kant’s Law of universal veracity in Of Hospitality; if I am never to lie, then how do I respond in the situation where I am hiding someone whose life is in danger and their persecutors knock at my door to ask if I’m hiding him? If I am to be always just, then how do I protect the self-governance necessary to my just action? The paradox is also there from the point of view of mere laws or conditions of justice; without the call of an absolute, irreducible justice, all laws are empty and arbitrary. One would be faced with the problem of there being a complete equivalence between all paths of action. At best, one could speak of the limitation of injustice, but even this requires some sense of absolute justice; there is still the Law on terms of which this notion of injustice is derived. Without the call of unconditional justice, there would only be the most extreme relativism, and laws, in having only an arbitrary raison d’être, would necessarily become oppositional and antagonistic for fear of dwindling into obscurity. As such, the thinker of justice has a double responsibility: towards the call of the absolute that is always before us and never present and; towards the specific, irreplaceable “differents” for whose sake we are just. However, this doubled responsibility is a paradoxical one, for even in being mutually dependent, the unconditional and conditional are each a constant perversion of the other; the necessity of having conditions for justice renders unconditional justice impossible, and in being a mere disappointment of unconditional justice, conditional justice is not even “worthy of the name”. Our deconstruction of justice leads us, then, to a point of aporia, of total paralysis. However, for Derrida, this point of impasse is the only space from which justice can be thought, for it is in the experience of aporia and only aporia that the unconditional and the conditional are preserved in their nearness and co-belonging without being reduced to one another. That is to say that pure justice is impossible; to forgive, or to be hospitable in a just manner is to do the impossible. It is important for us to think this aporia deeply, for it will be instrumental in marking a subtle but important divergence between the thought of Ereignis and that of différance. In Aporias, Derrida notes the difference between problem and aporia as modes of thinking a decision. The former, which stems from the Greek word problêma meaning to project/to protect, is a method of projecting a telos upon the oscillating undecidability of différance and thus creating a protected space within which to make the decision. In its concern with the demarcation of the conceptual borders of logos, problem is the oppositional mode of thought prevalent in the history of metaphysics; it can only ever concern itself with that which can be presentified, and thus cannot but do violence to the dynamic nature of the thing, the event or the persons. Aporia, on the other hand, is the experience of the oscillation of différance, an undecidability that renders any decision impossible. For the decision to occur, it must be an arrivant, something which arrives from outside the conceptual border and that requires a rupture in thinking. It becomes obvious to us in this analysis of aporia that we are still within the realm of “letting-presence”; the modality of thought that conceives of arrivant as totally other, totally unique, is certainly born from the very same that thinks Being without recourse to the logos of presence. However, we begin to understand why, for Derrida, the notion of revealability is not in keeping with the true dynamic of “letting-presence”. It is tempting for us to write that, in marking Being as the unthought of the History of Metaphysics, Heidegger reduces all otherness to Being; this would certainly give us grounds for writing Heidegger’s project off as committing the same crime with which he charges logocentrism, merely replacing the term “Being” with that of the “Other”. However, just as we guarded ourselves against a reading of the “framework” as a tyranny of Being over man, so too should we be cautious against a conception of Being that merely opposes it to otherness. I believe that the Derridean critique of the notion of revealability does indeed come from another place in Heidegger (something to which Derrida readily admitted on several occasions), but relates less to a prioritisation of Being over the Other than to the type or modality of Being that could be thought of as revealable and thus opposed to otherness. To consider that the revelation of Being in the Ereignis is at one and the same time the unconcealment of an originary revealability is in fact to do violence to the very notion of an active Being. It is to think of Being in terms of the empty stasis of problêma. The indecisive oscillation, that reticence (epoché or Verhaltenheit) already alluded to above (between revelation and revealability, Offerbarung and Offenbarkeit, between event and possibility or virtuality of the event), must it not be respected for itself? If we are to think Being in terms of différance, we must understand it as a generative force; that is to say that the Being that conceals itself in the giving of the world is itself a force of difference, one which cannot be spoken of in terms of origin, and whose revelation would be at all points the impossible arrival, the shock of a lightening strike. It is only in respecting the perpetual nature of the oscillation between Being and the entity that the Ereignis can truly be thought. Ultimately this is the only conclusion of thinking belonging together in the fashion proposed in “Identity and Difference”. We can see here how close, and yet how radically distant, the thought of différance is in relation to Heidegger’s project. At this point in our study, différance and the thought of trace appear to be at once the fulfilment and the ultimate nullification of Heidegger’s attempt to think Being. This latter appearance will be thoroughly challenged in our third section; for the moment, it suffices to say that différance is a corruption of any notion of revealability. Différance does not have a merely forgotten origin; it is immemorial, and is thus infinitely other and admits of no revelation or indemnification. That is to say that the indecision of différance is always and already in oscillation. In his essay “Faith and Knowledge”, in which he discusses the “limits of reason” in thinking the religious, Derrida evokes the thought of chora, an “utterly faceless other” that resists all naming or representation. If we are to truly think the active, generative thought of Ereignis, then this “always and already” must be understood in its radicality at the very limits of thought. There is no remembrance as possible remembrance, no origin that can be thought in terms of beginning. Chora “says the immemoriality of a desert in the desert of which it is neither a threshold nor a mourning”. In Being and Time, Dasein was privileged among the entities for the very fact that it was capable of posing the “question of the meaning of Being”. Indeed, the existential analytic takes as its point of departure Dasein’s essential openness towards this question. Heidegger’s task in Destruktion is one of forcing the inadequate questioning of Being in the History of Metaphysics back upon itself. Throughout Heidegger’s philosophical project, we are guided by the question, ‘why is there something rather than nothing?’ However, if we are to remain within the modality of “letting be” from which we have followed the rupture in thinking that the Heideggerian and Derridean projects demand, then we must question the question itself. In its will-to-discover, the question seems to have the desire to encompass the hitherto unknown within its own realm of understanding; its telos seems to be one of bringing into presence before it is a letting presence. As such, the privileging of the question as a means of interrogating Being – indeed, even the very thought of interrogating Being – can be criticised for its unsuitability to Being’s fundamental temporalität. Brought under the scrutiny of Derrida’s analysis of aporia, the question seems to remain within the projection/protection of the problem: a force of thought that wishes to assimilate, to understand within the confines of what is already understood. We can see, in this analysis, the importance of the term “other” – a term which is often used much too readily in recourse to a generic ethics, favouring sentiment before philosophical rigour. At this point, we hear “other” as the only name that can be uttered within the dynamic of “letting be”. We hazard a proposition; that “other” is not a name at all, but a link; like the trace, it is here as elsewhere. The question, in our current understanding of it, integral to the dynamic of revelation as revealability, does not respect the constant oscillation of indecision for itself; it cannot think the other as the other in terms of the other. In always searching to bring near, the question disrupts nearness itself. Our questioning of the question seems to have deposed it from its privileged place in the meeting of thought and Being. That which has hitherto been seen as the greatest tool of thought seems to be incapable of thinking Being (the task for which thought exists). We are left in wonderment as to whether there is any possibility within language, within thought, of linking with otherness as otherness – of establishing any meaningful interaction with Being as always and already other, caught in the oscillation of différance since time immemorial and in a future that will never come for us? It is with this “question of before-the-question” in mind that we approach the subtle and often implicit treatment of affirmation in Derrida’s philosophy. As we shall see, our bracketing of the assertion that the question is the “piety of thought” does not exhaust our engagement with Heidegger; in fact, it is only at this point, having seemingly lost so much of what is central to his project, that we enter into what is most radical in his thought. For it will emerge for us that the rethinking of the question at the limits of thought is in fact the most Heideggerian of moves. …est-ce que penser c’est questionner, comme il disent souvent, les philosophes? Est-ce qu’il n y a pas, avant la question, d’une facon plus radicale, plus ancienne, plus profonde, un mouvement de pensée qui n’est pas questionnant mais qui est au contraire une affirmation? What will emerge in our third section does not amount to an opposition to the question or to questioning, but rather to an understanding of a modality of thinking by which the question’s role is not that which we ascribed to it above: that of a violent and ultimate reduction of the questioned to presence. In the quote above, taken from an interview given by Derrida on the subject of trace, he mentions “a movement of thought which is not questioning but is rather an affirmation”; our goal here is not only to develop an understanding of this “more radical, older, deeper” movement but also to grasp the relationship that it holds to the question, whether as ground, precedent or something entirely other. It is at this point that we finally engage with the holding thread in this challenge posed to thought by Heidegger and Derrida’s philosophical interaction. For, as has been the case before for us, we find that our reading away from Heidegger through Derrida is a way leading directly back to Heidegger, this time to the notion of Zusage in thought, a term which informs Derrida’s tracing of that which in thought is an affirmation of the otherness of the other as singular other. We will take as our beginning point the lines in Heidegger’s lecture “The Nature of Language” which follow those quoted above in relation to his notion of the question as the “piety of thought”. The lecture ending with that sentence [Questioning is the piety of thinking] was already in the ambiance of the realization that the true stance of thinking cannot be to put questions, but must be to listen to that which our question vouchsafes – and all questioning begins to be a questioning only in virtue of pursuing its quest for essential being. In this lecture of 1957, wherein the neighbourly relation between poetry and thinking is explored, Heidegger seems to anticipate Derrida’s misgivings about the privileging of the question in thought (in the space of this thought, where precedence is neither logical nor chronological, one could perhaps permit oneself to say that Heidegger echoes Derrida). He repeatedly writes that the proper attitude of thinking does not consist of the putting of questions, but rather of a “listening to the grant, the promise of what is to be put into question”. “Grant” is the translation of Zusage given by Peter D. Hertz, but Derrida prefers to maintain it in its original German form, thus liberating a wider scope of meanings: promise, agreement, acquiescence, abandonment, and most often, affirmation. However, we are not to think that it is merely that this “listening” should precede the question; it cannot but precede it; that is to say that the question cannot be asked without stemming from this “listening”. Similarly, our listening to the “grant” or promise in thought is also that which always develops into our demanding of an answer. Even at this early point in our analysis of Zusage it becomes apparent to us that a headlong rush to strike the question from thought would be misguided. Perhaps we can better follow the “way” that Heidegger wants our thought to move by travelling with the sense of his thought in “On the Nature of Language”, and his strange preoccupation with a small selection of Stefan George’s poems. A short section on “Sea Song” will be of great import to our project, but to get to it we must first look at another of George’s poems, “The Word”. This theme of “revelation as mystery” grows even stronger in the poem “Sea Song”, which together with “The Word” forms the final volume of George’s Das Neue Reich. Here again, the poetic voice is concerned with something, or on this occasion, someone, for whom he has no name. That I may see a cherished guest. The “cherished guest” in this stanza is our doorway into the space of Zusage in Heidegger’s thought. Like the prize, the guest cannot be named, is totally unnameable, and is yet “cherished”, for “nameless remains also that highest favour which comes to the poet.” The poet says the cherished guest and the prize, but he does not name them, and Heidegger is eager to point out that this is not the mere keeping of a secret on the poet’s part. He doesn’t name them because he doesn’t know the names. The prize, and the cherished guest, are there in the poem, spoken for us, but they are at the same time completely other; if we can permit ourselves a ventriloquism of Heidegger’s language in a vocabulary that is not his own, prize and guest other in the poem in the same verbal sense by which we saw Being be in our first section. They are actively other than present. This particular modality of thinking the other in its sense of being-other marks the beginning of our negotiation of Zusage, but it by no means exhausts it. We would be doing a certain injustice to both of the poems if we were not to “listen” to the world in which this unnameable nature of guest and prize are evoked. In “The Word”, the revelation as mystery of the relation between the word and the thing is coupled with the poetic speaker’s great sadness at being unable to grasp his prize. Similarly in “Sea Song”, the unnameable nature of the guest is coupled with the poetic speaker’s want to see them. This want – or desire – for the naming of the unnameable, which is irreducibly and at once an acknowledgement of this very same unnameableness, steals us into step with Heidegger’s “way” in thinking Zusage. The “listening” which thinking performs prior to questioning is at once an affirmation of the otherness of the other and the desire for that other that leads us to question, to want. Indeed, one could say that affirmation and desire are each undercurrents of the same movement in thought. The sense of the relation evoked in the line, “where word breaks off no thing can be” becomes clearer to us, and returns us to the thought of the constellation between man and Being; the desire to name, to speak the unspeakable, is that which makes ineffability meaningful. The desire to question that grows from the acquiescence of Zusage is what gives sacredness to the otherness of the other. This understanding of Zusage makes sense of Heidegger’s discussion, later in the lecture, of the neighbourly relation between poetry and thinking, and in a bigger picture the necessary relationship between “poets and thinkers” that he, as the latter, engages in in his later philosophy on language and being. The poet and the thinker, like affirmation and desire, are two movements within one movement in thought; and their neighbourly relation is the radical dynamic of thought appropriate and appropriated to the thinking of Being. A new sense of breaking off, itself doubled, evocative of diverse movements. We see that the word’s breaking off is not one of the inability to name, but rather of a failure to engage with the unnameable. That is to say that the breaking off of the word would evoke the absence of a certain commitment, a pledge or a grant, rather than the absence of knowledge. For the word to break off is for the thing not to be reached towards, not to be affirmed in its mystery – not to be desired. It is perhaps also true to say, then, that the naming of the thing – the successful “grasping” of it, would also be a breaking off of the word. And he concludes from this that, far from being exiled on the earth like a fallen stranger, the soul is on the way towards the earth…the soul is a stranger because it does not yet inhabit the earth – rather as the word “fremd” is stranger because its meaning does not yet inhabit, because it no longer inhabits, its proper althochdeutsch place. A sort of promise of originary alliance to which we must have already acquiesced, already said yes, given a pledge [gage], whatever may be the negativity or problematicity of the discourse which may follow. Furthermore, Derrida writes that the structure of this gage is such that it is “already too late, always too late”. Which is at one and the same time to say that it always and already oscillating in the final moment of George’s poem “The Word”, lacking, desiring, affirming. With this strange dialogue between poet and thinker in mind, we return, at last, to the notion of trace, to make the assertion that in being thought together these two modalities of thought, unspeakable as themselves, will shed great light upon one another as well as upon the entire thread of our project here, from our earliest ventures to think the Ereignis on its own terms. When we encountered trace earlier in our study, we mentioned it as the thinking of that which is other-than-present as other-than-present. At that stage in our way through this thoughtworld, to say that trace could furthermore be thought (bearing in mind the nature of the soul’s strangeness upon earth in Trakl) as the presence of the other-than-presence, and, in the same movement, the other-than-presence of what is present, would have been premature and obscure. However, our brief visit to the neighbourhood of the poet and the thinker allows us to speak of trace in a different language, one in which its link with affirmation and desire can be addressed fluently. Earlier in this essay, I mentioned the possibility of understanding the term other not as “name” but as link. It is with the notion of a “link” with otherness in thought, and thus with the oscillation of a generative, dynamic force of Being, that we approach trace and locate it within the world of the poet and the thinker. It is the modality at play when we think a “listening” to the Zusage that is prior to all questioning, in the sense that trace is what first gives us the thought of an “other” as unknown. As the presence of something absent it is a glimpse of something mysterious, a stray thread in the tapestry of all that is present for us in logos leading into something radically other, beyond our imagination and conceptual borders. Trace is the affirmation of this total otherness, and is furthermore an acknowledgement of the prize that is this radical alterity; it wonders at the sensation of logos’ finitude in being unable to represent the other in thought. However, this affirmation of the other is also a desire for the other, born out of the same wonder, the same sense of mystery. This desire is for us the call to question, to negate, to deconstruct. As such, trace is what leads to the question, just as the poet’s thought was that which enabled that of the thinker. The question, as we noted before, is equated with a bringing into presence for – a trait for which we deemed it unsuitable to thinking the letting presence of Being. However, thought within the framework of the Zusage in thinking, we can “re-inscribe it in a movement which exceeds it”. The question, in wanting, is the exact form of thought suited to the différance of Being, whose refusal of itself is its “highest form of gifting”. Without being desired as such, there is no meaning to the refusal of Being; otherwise its oscillation is generic, mere chaos. Being is for man even in the simple fact of concealing itself from him, and the understanding of this is key to an arrival at the thought of aletheia: unconcealment as concealment, concealment as unconcealment. Being has the dynamic of a secret; it is most precious not because of being known or unknown, but rather because in being demanded, it can be meaningfully refused. This dynamic of demand and refusal precedes any question of revealability or even non-revealability. It is the belonging together of man and Being that precedes any identity that might separate them. However, we cannot leave the trace at the moment of the question either, for the nature of trace is that it rests at no point in any movement of thought. The question itself does not become aborted by any refusal; indeed, the responsibility of the question is always towards one, singular, present moment, and when related to the subject of justice, is relentless in its demand to bring all of the hitherto unknown aspects of a situation into presence, to discuss them, condition them, act justly upon them. The question will always succeed, to a certain degree, in its quest to bring the unknown other into presence. The nature of trace and of the “listening” in thought is such that it reveals this presence also to be a mystery; it “reveals” the thread brought into logos by the question within a totally different tapestry, once again as something radically other – as the absence of something present. As such, we see that lack, desire, affirmation are all caught up in an endlessly proliferating flux in thought wherein the question is indeed the piety of thought, but is also necessarily insufficient for thought and thus the instigator of its own perpetual repetition. Trace, as the subtle evocation of all of the above, is the unspeakable dynamic by which we can think the Ereignis of man and Being; it is the experience of thought as thought, and is as such, given the co-belonging of thinking and Being, as near to Being as Being is to itself. We have uncovered the keystone to our project; to experience language in the modality of trace, which is also that of the neighbourhood of poet and thinker, is to “think” Being. It is also to think Being as other, not in a sense that reduces otherness to logos, but rather in the comprehension of a generative force of Being that is always becoming other than itself. In thinking Being as such, we lay aside the ultimate antagonism of dialectical thought that would oppose Being and the Infinitely Other. A rigorous engagement with any of the terms we have used to prepare the “spring” in thought necessary to think Being – dynamic, generative, corruptive, oscillating­ – reminds us that they are also the movements proper to a thought of infinity, which is by its nature always and already other. We cannot think infinity in terms of some “thing” whose borders we have not yet managed to encompass in thought; infinity is something whose very nature denies any thought of border – whose essence, arrival, event or revelation would be a shock even to itself. This otherness is not merely alternate. It others. I believe that this is the very dynamic of Being that Heidegger wishes us to experience in language, in carving our way through the neighbourhood of poet and thinker. We are urged to experience this dialogue within language itself not merely as a means of thinking Being as if Being were somehow in the world outside of language, but rather as the space wherein Being and language are inseparable from each other – where their belonging together exceeds any notion of a meeting of two separate identities. Our understanding of the temporal dynamic of nearness discussed earlier in our essay now becomes crucial. We touched upon the fact that the “other” ecstases of time, those we termed “past” and “future” had necessarily to be thought as themselves, but at that stage in our study it seemed that this was a mere structure of thought necessary to a non-reductive thinking of the “thing”, as if the Ereignis were merely something “discovered” in nature and consequently attested to by thought. Now that we understand the listening and reaching out of language to be inseparable from the Being of the thing, we see that this notion of thinking the ecstases as themselves is essential to the aforementioned experience of Being in language. We have already dealt with this theme obliquely in our discussion of the Stefan George poems; it becomes even more explicit when thought in terms of trace. Our examination of trace given above dealt with it in terms of a link. This sense of link was for us the concept proper to a notion of becoming that is both generative and corruptive; that is to say that the trace is both that which gives us a glimpse of the other as other, generating our desire for the other, and that which in the same movement allows the other to other, to become other, even as we bring the “prize” into our presence. As such, even in our experience of something as present there is the experience of a return to something other. This experience is what makes the Zusage so decisive for Derrida as a reorientation of the nature of language in Heidegger; in the experience of language, Zusage is a pledge or affirmation that is always and already made, in a past that, in essence, is not our past – a past that we have never experienced. This “other” past is the same immemoriality that we discovered in chora, a “desert in the desert”. Similarly, the “other” future of trace is beyond what is “to come” for us (avenir). The nature of the becoming that we are trying to think in terms of Being and otherness becomes apparent to us; to think trace and nearness we are forced to think a becoming that is not a becoming-present. As such, the experience of language, as outlined explicitly above in our interaction with poet and thinker, is always an experience of that which we cannot experience as presence. This is the aletheia of Being: the experience, in language, of that which reveals the finitude of language, and thus unconcealment as concealment. Being, secret, prize – they are each nearest to us when we experience them as themselves, listened to and pursued by the word, dynamic in being desired, meaningful in refusal. To experience language on the plain of trace, acknowledging the adverse and yet interactive movements within the co-belonging of thinking and Being, is to make the “spring” in thought necessary to understand the “event” of Ereignis, and thus to “think” Being in a modality and movement of thought forgotten in the History of Metaphysics. The movement of our project has been one of re-inscription, where the strength of our ending lies in how it returns us to a better understanding of our beginning. Our conclusion is such that it ruptures once again the point from which the essay departed; it is already a rethinking, on its “way” towards a summary that cannot ever be reached. It is perhaps most fitting, then, that our words in closing this essay reflect upon this rupture from end to beginning, most specifically on what we have discovered to be the relation between thinking, Being and Ereignis. What becomes most apparent in moving from the third section of our project back into the first is that we arrive with a completely different sense of what “thinking” is. It seems that any engagement with Heidegger’s work on language and thought must approach as if in reverse, because our point of departure will always be one at which we imagine that his task consists of trying to force thought to accommodate Being, the latter being something which, in having hitherto been unthought, is totally inconceivable to us. It is only in returning to this first engagement with the Ereignis that we can re-inscribe it within a “way” of thought that wants us to learn about the experience of thought and language themselves, furnished with the understanding that language and Being are always and already appropriated to one another. To say that they belong together is not enough unless understood in terms that totally abandon any tie with the sense of two separate identities merely fitting for one another. We must understand that to have an “experience” of thought or of language is already to think Being, for Being and thinking are the Same. An improper engagement with this belonging together is detrimental to any understanding of what Heidegger believes the “task” of thinking to be. We are otherwise in danger of misunderstanding both thinking and Being, imagining that what Heidegger terms their “destiny” is some conclusive event by which thinking encompasses Being and is complete. The experience of thinking encountered in following Heidegger’s “way to language” is radically different to that of logos, and, consequently, Being is radically other than anything thinkable with recourse to logos. The value of Derrida’s thought of trace is that to a certain extent it makes explicit the non-logocentric dynamic by which Heidegger wishes us to think Being. From the point of view of thinking, we have guided ourselves through what one might term its “moments”: affirmation, desire, question, corruption, affirmation…and so on. We have come to understand that the question is “pious” in respect of the thought of Being not because it succeeds in bringing Being into presence, but rather in view of the fact that it cannot do so, or more specifically that the presence into which it tries to bring Being, whether that of thing or person, is always itself divided. In everything there is the trace – that which is a return to something completely other. The piety of the question lies in the fact that its desire for the other is always first and foremost an affirmation of the other, and most importantly, that in desiring it creates a meaningful encounter with that which is otherwise completely alien to thought. We have already evoked this dynamic with recourse to that of a secret: that in being demanded, the secret is meaningfully refused. Heidegger’s “way” to the thought of Being could be seen as evoking the same dynamic, but one wherein the secret is not known by anyone, or where its nature is such that it cannot be known. In such a modality of secrecy, demand and refusal are no longer mere subsidiaries of the secret’s own autonomous meaning – all meaning is contained in and within their interaction. It is with this modality in mind, which is also that of poet/thinker/word and thing, that we understand the import of the experience of language in Heidegger’s thought. It is an experience of two converse movements within the same: one reaching out and demanding presence, the other always becoming other, generating and corrupting. An experience that in both affirming and desiring is a respect for the indecisive oscillation of these two movements as and for itself. Precisely because this entry requires a spring, it must take its time, the time of thinking which is different from the time of calculation which pulls our thinking in all directions. Today the computer calculates thousands of relationships in one second. Despite their technical uses, they are inessential. We should not underestimate the profundity of the challenge posed by this “spring” in thought. In order to follow the movement of this “way to language”, thought itself is required to understand in terms of movements, becomings and morphologies. Even the notion of understanding is challenged; we are persuaded to relinquish the sense of mastery in thought, of having grasped once and for all, reached the summit. Perhaps at best one could say that to understand is to listen with a careful ear. However, the renouncing of our traditional modality of understanding is also that which brings us closer to the “why” of thinking and Being; like the poet we become privy to a mystery, and come to understand our own role, always and already in relation to it. As such, we can see that the task of “thinking Being” is not a mere mental exercise or stretching of thought to encompass something that has hitherto evaded it. It is an engagement with the meaning of thought itself. Heidegger points out that this modern age is that which creates the space, or framework for this spring in thought. This is true not least because of the great speed at which “calculation” is creating unimaginable distance between thought and thought’s ownmost nature. The task of thinking, of experiencing the converse movements within thought, is perhaps the only task, imminently perpetual and perpetually imminent. Derrida, Jacques. Acts of Religion. Ed. Gil Anidjar. New York: Routledge, 2002. Derrida, Jacques. Adieu to Emmanuel Levinas. Trans. Pascale-Anne Brault and Michael Naas. Stanford: Stanford University Press, 1999. Derrida, Jacques. Aporias. Trans. Thomas Dutoit. California: Stanford University Press, 1993. Derrida, Jacques. Margins of Philosophy. Trans. Alan Bass. Chicago: University of Chicago Press, 1982. Derrida, Jacques. Of Grammatology. Trans. Gayatri C. Spivak. Baltimore: Johns Hopkins University Press, 1976. Derrida, Jacques. Of Hospitality. Trans. Rachel Bowlby. Stanford: Stanford University Press, 2000. Derrida, Jacques. Of Spirit. Trans. Geoffrey Bennington and Rachel Bowlby. Chicago: The University of Chicago Press, 1989. Derrida, Jacques. On Cosmopolitanism and Forgiveness. Trans. Mark Dooley and Michael Hughes. London: Routledge, 2001. Heidegger, Martin. Basic Writings. Ed. David Farrell Krell. San Francisco: Harper Collins, 1993. Heidegger, Martin. Contributions to Philosophy (From Enowning). Trans. Parvis Emad and Kenneth Maly. Bloomington: Indiana University Press, 1999. Heidegger, Martin. Identity and Difference. Trans. Joan Stambaugh. Chicago: University of Chicago Press, 2002. Heidegger, Martin. On the Way to Language. Trans. Peter D. Hertz. San Francisco: Harper Collins, 1971. Heidegger, Martin. Poetry, Language, Thought. Trans. Albert Hofstadter. New York: Harper and Row, 1971. Heidegger, Martin. What is a Thing? Trans. W.B. Barton and Vera Deutsch. Chicago: Regnery 1968. Kant, Immanuel. Critique of Pure Reason. Trans. Paul Guyer and Allen W. Wood. Cambridge: Cambridge University Press, 1998. Derrida, Jacques. Lecture given at conference entitled “Other Testaments”. Toronto, 2002. Accessed at http://www.youtube.com/watch?v=bxpTNO85tu8 on 17/07/10. Derrida, Jacques. Interview given on the subject of trace. Accessed at http://www.youtube.com/watch?v=Z2bPTs8fspk on 14/07/10. Martin Heidegger. Introduction to Identity and Difference. Trans. Joan Stambaugh. Chicago: University of Chicago Press, 2002. 22. Jacques Derrida. “Différance”, in Margins of Philosophy. Trans. Alan Bass. Chicago: University of Chicago Press 1982. 2. Martin Heidegger. Being and Time. Trans. John Macquarrie and Edward Robinson. Oxford: Blackwell, 1962. 488. Martin Heidegger. On Time and Being. Trans. Joan Stambaugh. Chicago: University of Chicago Press, 2002. 24. See Heidegger, On Time and Being. 15. Martin Heidegger, “The Thing” in Poetry, Language, Thought. Trans. Albert Hofstadter. New York: Harper and Row, 1971. 78. Ibid. 178. See also On Time and Being. 5. Martin Heidegger, What is a Thing. Trans. W.B. Barton and Vera Deutsch. Chicago: Regnery 1968. Immanuel Kant. Critique of Pure Reason. Trans. Paul Guyer and Allen W. Wood. Cambridge: Cambridge University Press, 1998. Martin Heidegger, “Letter on Humanism” in Basic Writings. Ed. David F. Krell. San Francisco: HarperCollins, 1993. 215. Martin Heidegger. “The Principle of Identity” in Identity and Difference. 27. Heidegger. On Time and Being. 12. Heidegger. “The Principle of Identity”. 31. Heidegger. “Letter on Humanism”. 217. Derrida introduces différance “by way the theme of strategy or stratagem”. See: Ibid. 7. See: Jacques Derrida, De la Grammatologie. Paris: Les Éditions de Minuit, 1967. 103. Martin Heidegger. Contributions to Philosophy (From Enowning). Trans. Parvis Emad and Kenneth Maly. Bloomington: Indiana University Press, 1999. 285. Jacques Derrida, Of Grammatology. Trans. Gayatri C. Spivak. Baltimore: Johns Hopkins University Press, 1976. 158. Jacques Derrida, “Force of Law” in Acts of Religion. Ed. Gil Anidjar. New York, Routledge, 2002. 53-60. Jacques Derrida: Of Hospitality. Trans. Rachel Bowlby. Stanford: Stanford University Press, 2000. 67. Jacques Derrida, “Finis”, in Aporias. California: Stanford University Press, 1993. 11-15. Jacques Derrida. “Faith and Knowledge”, in Acts of Religion (ibid.) 59. The lecture that I am referring to was given at a conference entitled “Other Testaments”. The conference took place in Toronto, 2002. Derrida elaborates on offenbarkeit in response to a question posed by an audience member. I accessed the audio for this conference at http://www.youtube.com/watch?v=bxpTNO85tu8 on 17/07/10. Derrida. “Faith and Knowledge”. 56. Martin Heidegger. “The Nature of Language”. In On the Way to Language. Trans. Peter D. Hertz. New York: Harper and Row, 1971. 72. This quote is transcribed from a television interview given by Derrida on the subject of trace. It was accessed at http://www.youtube.com/watch?v=Z2bPTs8fspk on 14/07/10. Heidegger. “The Nature of Language”. 72. All quotes taken from “The Nature of Language”. 60. Martin Heidegger. On the Essence of Language. Trans. Wanda Torres Gregory and Yvonne Unna. New York: SUNY, 2004. 59. Heidegger, “The Nature of Language”. 77. Jacques Derrida. Of Spirit: Heidegger and the Question. Trans. Geoffrey Bennington and Rachel Bowlby. Chicago: The University of Chicago Press, 1989. 88. Heidegger. Contributions to Philosophy (from Enowning). 285. Derrida makes reference to the term “Adieu” in the philosophy of Emmanuel Levinas as being evocative of this notion of a future which is beyond our future experience. See: Jacques Derrida, Adieu to Emmanuel Levinas. Trans. Pascale-Anne Brault and Michael Naas. Stanford: Stanford University Press, 1999. Heidegger. Identity and Difference. 41.